The abbot of Samnak Wimuttidharmmaram (สํๅนักวิมุตติธรรมๅรๅม) is Ubasika Methika Dechaboonyarat (อุบๅสิกๅ เมทิกๅ เดชะบุญญรัตน้), or also affectionately known as Khun Mae (nun who teaches Dhamma). Note from admin: Khun Mae in her humility had only wanted to keep the introduction to her to a minimum. Below is recounted based on what we know from the time we spent and know her. We hope this would at least address some questions that visitors may have about her. I have also included series of her Dhamma sharing, taken from my own jottings of her teachings with the hope that her teachings can continue to inspire others to the Dhamma, just like how I myself have been deeply inspired. As a layperson, Khun Mae was a businesswoman- having 2 shops with businesses earning her a comfortable living. She had always been a devout Buddhist- incorporating 5 precepts, chanting and supporting monks in daily alms. During Buddhist observance days, she would visit the temple to observe 8 precept whenever she can. She said herself was an example, when as a layperson she had enjoyed brisk business, making profits even if those around her was not doing well because she practiced chanting, meditation and held on firmly to 5 precepts (and 8 precepts on Buddhist observance days). Nothing amount to self practice. However, her life changed when she undergo a tudong practice- at first she did it to thank the Buddha, Dhamma and Sangha. It was certain insights that had occurred during that period made her know without a doubt in her heart that she must ordain and leave the laylife. Khun Mae undergo ordination at the age of 33 in 1992. During the early years, she underwent tudong (ascetic practice)- where she went to forests, caves, cemetries to practice. Her only possessions were what she could carry on her hands and shoulders. She did this for 5 years- where 3 years she carried no money. She would sometimes made stops at stay for a short while in monasteries before going on in her journey. Often she travelled alone, sometimes she had other fellow nuns who went with her. There were stories that she often shared with us on her stays in the monasteries which we would try to include more in Dhamma sharing section. Many people wondered why she was in brown robes. Sometimes she had been mistaken as a bhikunni. She had wore the brown robes because she had underwent the ascetic life- staying in forest and wilderness area. It is not practical to wear white. Furthermore, she undergo daily pindapat (almsround) and as a woman travelling alone and white clothings can get quite transparent when drenched in the rain. Khun Mae lived the ascetic life with contentment. She had intended to practice and spend the remaining of her life in the forest. However, some incidents had led to her setting up a place of practice. Also, during her tudong- she had made brief stops at monasteries and she saw that in some place, it is not easy for women who are poor to come and practice. She told herself that should ever she had a place of her own, she would help those who are willing to learn, regardless of their social and wealth status. After about 5 years, she was offered a piece of land for her to set up a temple in Nan area. She accepted and decided to settle in to help and teach others. What made her decided to accept was because she contemplated that if she is to teach others to follow the Buddhist way of life, it would be hard to teach others if she did not have a fixed place where people knew they could find her. Still, life was hard and funds were scarce- but Khun Mae never complained, having being accustomed to the harsh life. Day and night she cleared the overgrowth and weeds in the land- taking only short rests in between. The place was cleared from the overgrown. Unfortunately, the owner changed his mind after seeing how nice his place had become. He wanted to reclaim back the land. Khun Mae had no issues with letting go and wanted to continue with her tudong lifestyle- after all, she had intended to spend and die in the forest. However, later some followers wanted to offer her another land- for her to settle and teach them Dhamma as they have been impressed with her calm and resillient demeanour. The land offered is the current Samnak Wimuthidhammaram. The land had been an abandoned land for as long as villagers there can remember. A lady who is in her 60s now said that her grandma said that no one dared to go to the land at night. A Thai lady, who is now a nun staying with Khun Mae recalls that when she first visited Samnak in year 2004 and stayed as an 8 preceptor, it was overgrown with tall weeds. 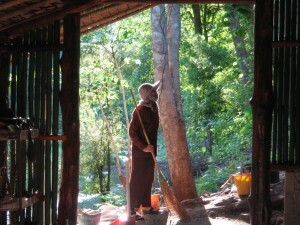 Day and night Khun Mae and the other nuns would be clearing weeds. Food was based on pindapat.. Khun Mae always emphasized on having metta (loving kindness), compassion and transferance of merits. So long as we uphold our precepts, it becomes our protector. One day while fixing the roof, she felt down all the way and the impact dislocated her backbone. At that point she could have died but a thought came that if she died, then she cannot teach to others who may have benefited from it. She lived but it was with great pain- she was alone when she felt down and struggled by rolling her back with hot water bottle. Using breath meditation, she was able to regain movement of her back. Still, she had walked with great difficulty and due to the injury, she was not able to carry the food in the daily pindapat. But the severe back pain followed Khun Mae for few years. One day, a nun friend who took pity on Khun Mae’s condition invited Khun Mae to accompany her to Indonesia to try to seek treatment. Due to certain changes in circumstances, the trip to Indonesia did not work out and instead she took Khun Mae down to Singapore. That time, Khun Mae could only converse in Thai. As she stayed in a monastery in Johor, she quietly performed the daily chores without being asked- sweeping leaves and pulling out weeds. That was done with her back injury- because another elderly Malaysian nun had said that during that time, Khun Mae’s back condition was so bad that she could not make a complete bend down to prostrate during chanting. This nun, who is well versed in healing using Chinese medicine, took pity on Khun Mae and boiled some Chinese medicine for Khun Mae to drink. Both could not communicate in any common language that time. The abbot of the temple recommended a Chinese physician in Singapore for Khun Mae. The physician was one of the key persons who had helped to heal Khun Mae’s back, through administering beating with bamboo sticks- till the black blood clots rose up to the skin surface. He said that in his 20 years of experience, he had never seen anyone with such severe back condition and yet never complained about it. Complimenting with herbs, Khun Mae was able to regain most of her back movements. Till today, Khun Mae always spoke of this physician with a lot of gratitude and continously recommend her followers to visit this physician. That is why Khun Mae had a lot of knowledge about pain- when people who have joint or leg pain told her they could not sit due to the pain, Khun Mae would share on mindfulness breathing. When they don’t believe, Khun Mae may share the story of her broken back (till today, she said that there was not a day that she does not have the pain, but with automatic mindfulness the pain just is a physical condition- it does not bother her). It was also during her stay that she met some of her earliest non Thai followers. During that time, Khun Mae also could not converse in Mandarin and constantly remained in low profile. However, Khun Mae later made the decision to learn Mandarin in order to convey the teachings more accurately to those who wanted to learn. This was because she realised that even though a person who could help her translate have the best of intentions, the translation can still become inaccurate which would result in misunderstanding the Buddha’s teaching. Initially it was through some sign langugage where people would point at an object and said in Mandarin. Eventually Khun Mae picked up phases of Mandarin. Within a year, she could converse in Mandarin even though she only stayed in Singapore one month out of that year. She said that when one is sincere in learning something, one can do it (so the excuses that we often give her for not doing anything does not hold water 🙂 ). Over the years, Khun Mae had encountered various obstacles and challenges. Many people would have just given up but Khun Mae is very tough and resillience in facing obstacles. She said that if one is sincere in practicing the Dhamma, one should never give up in the face of obstacles and setback. Whenever she wanted to start on a meritorious event such as setting up the Cave and Samnak’s 10 year anniversary Wesak 2010– everything that could go wrong just went wrong. I personally witnessed and experienced these challenges. But Khun Mae’s almost superhuman way of overcoming them…..is really admirable. She worked harder than anyone. None of us could match the physical and mental work she put in to plan and get everything done….and to have to fix things that went wrong. Yet, she was always patient and compassionate to use these as Dhamma lessons. No matter what mistakes we made, she always forgive us and slowly explain the lesson to us. She never allowed any discrimination- ie isolating or judging anyone to happen in her temple. By 2012, it would be her 20th year being on the robes. From the time she had ordained, despite so many obstacles and hardships….. never had the intention to return to lay life had crossed her mind. She has been a beacon of strength for many- offering advise on how to solve one’s problem and difficulties. Till today, she continues to teach and help others tiredlessly. She always attempts to understand the person’s constraints and make suggestions for the person to overcome his/her personal difficulties or setbacks. She teaches the method of solving one’s own problems using one’s own inherent power…. through developing stronger mindfulness and calmness (through breathing in…breathing out), observing the precepts, practicing meditation and chanting. She also encourages one to observe 8 precepts, and in some to undergo temporary ordination. 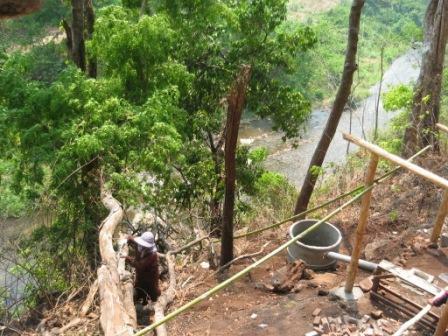 Taken in May 2009- Khun Mae was constructing the Cave temple and was in deep though as the late afternoon sun shone on her. Let us support Khun Mae to the best of our ability- Khun Mae always say, it is not about the donation or dana- we can support in our practice. Donation of $1, made sincerely from the heart brings in more merits than large amount donated for name or fame. Self practice brings more merit to the person more than any donation could. She always said, if someone offered her one million in exchange for observing 8 precepts/ ordaining, she would anytime want the person to come and practice. Because being in the robes even for a temporary period, brings more merits and benefits to that person that any amount of donation can. The memory will imprint in the person’s mind and at death, the person can recall the practice to bring him/her to a better path.